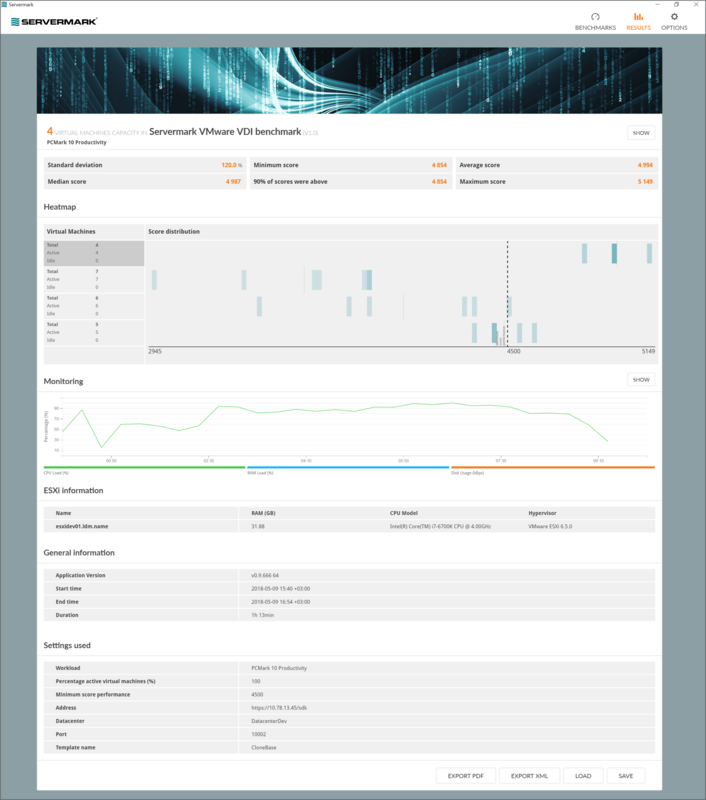 Today we are releasing Servermark VDI, a new benchmark for testing the performance of Virtual Desktop Infrastructure servers. Designed for industry, enterprise and press use, Servermark VDI brings UL’s trusted expertise to IT professionals looking for accurate and impartial server benchmarks. One of the big challenges for VDI implementation is capacity planning. Estimating is difficult because the demand for VDI resources can vary across teams, by the type of work performed, and even by the time of day. Overestimating the requirements can lead to underutilized hardware and increased costs. Underestimating the requirements, on the other hand, can result in a poor user experience and reduced productivity. Benchmarks help IT professionals objectively measure server performance. Testing different scenarios with relevant benchmarks can produce practical data for accurately estimating VDI server requirements and end-user performance. Servermark VDI is a benchmark for measuring the performance and capacity of Virtual Desktop Infrastructures. Servermark VDI is easy to install, run, and understand, which means you can test and compare server hardware configurations with confidence. Servermark VDI uses workloads from PCMark 10 and PCMark 8, our industry-standard PC benchmarks, to measure virtual machine performance. You can choose from a range of workloads covering basic office work, such as web browsing, documents and spreadsheets, to more intensive tasks, such as photo and video editing, that require more processing, memory, and storage resources. This flexibility helps IT pros estimate and allocate VDI resources for different user roles, from basic office workers to power users and content creators. With Servermark VDI, you can also establish baseline performance expectations, track performance over time, and plan for future capacity needs. With regular benchmark runs, IT professionals can identify poor performance, detect system bottlenecks, and optimize server configurations to get more value from their hardware resources. Servermark VDI includes two benchmark tests. Both let you choose the benchmark workload and the ratio of active to idle machines to match the work roles and usage patterns of your end users. With the Servermark Universal VDI benchmark, you can test any virtualization platform—VMware, Microsoft Hyper-V, or Citrix XenServer, for example—that meets the benchmark's system requirements. This benchmark measures the end-user performance of each virtual machine in a given VDI configuration. You can use this test to determine if your server can deliver an acceptable level of performance for a specific number of virtual machines. Make changes and repeat the test to find the configuration that offers the best balance of performance and utilization. The Servermark VMware VDI benchmark is designed for the VMware vCenter and vSphere Hypervisor virtualization platform. This benchmark runs a series of loops and automates some of the manual work involved in running the Universal test. For a given configuration, the benchmark determines the maximum number of virtual machines that the VMware data center can support at an acceptable level of performance for the end user. Both benchmarks produce a set of useful metrics for comparing VDI capacity and end-user performance. A helpful heat map shows the distribution of performance scores for each virtual machine while monitoring charts show how the server CPU load, RAM load, and disk usage changed during the test. The Servermark benchmark suite covers a range of distinct server use cases. The suite currently offers Media Transcode benchmarks and the newly added VDI benchmarks, both of which are available separately. Servermark benchmarks are developed in cooperation with leading technology companies. OEMs, ODMs, component manufacturers, and their suppliers are invited to join UL's Benchmark Development Program to participate in the development of new server benchmarks. Servermark VDI is now available for industry, enterprise and press use. Find out more at https://benchmarks.ul.com/servermark.